WASHINGTON COUNTY – Two fires are now burning in the Pine Valley Mountain Wilderness of the Dixie National Forest as of Friday. The lightning-caused Oak Grove Fire has grown to 833 acres and remains at 10 percent containment since its ignition Tuesday. The new blaze, the significantly smaller Brown Trail Fire, started Friday morning and is currently a quarter-acre in size and has since been contained, according to a Forest Service press release. 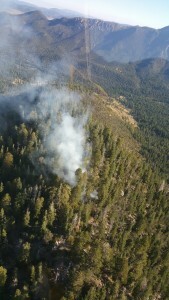 The Brown Trail fire was reported to the Forest Service Friday morning by Pine Valley Fire Chief Gerald Schiefer. Aerial resources attached to the Oak Grove Fire are being shared to help suppress the Brown Trail Fire as needed. 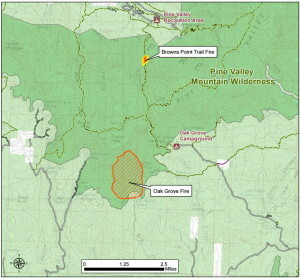 The fire is located near one mile southwest of the Browns Point Trail in the Pine Valley Mountain Wilderness, and is not burning near the Oak Grove Fire. The Brown Trail Fire was contained late Friday, according to an update from the Forest Service, and is believed to be lightning-caused. No structures are threatened by the fire and no evacuations have been triggered. The Browns, Forsyth, Equestrian and Summit trails have been closed due to the fire. The Forest Service released a brief update on the Dixie National Forest Facebook page that the Oak Grove Fire has grown to 133 acres and remains at 10 percent containment. Lighter smoke produced by the fire signifies a decrease in fire intensity and fuel consumption. 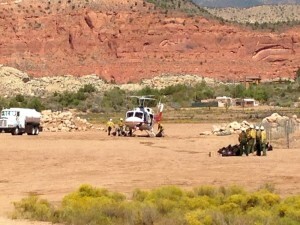 Additional hand crews were flown into the fire area to assist with fire line construction efforts. Warm weather will continue Saturday with moisture moving into the fire area late Sunday to provide some relief from the current dry conditions. As of Thursday, 136 people have been assigned to fight the fire. They are attached to local and regional firefighting resources. 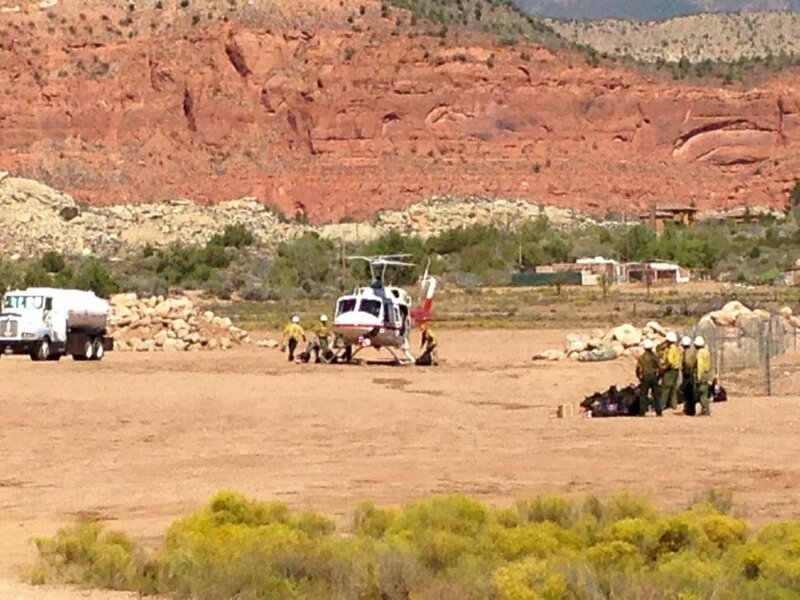 The fire is located two miles southwest of the Oak Grove campground in the Pine Valley Wilderness of the Dixie National Forest, and was ignited Tuesday morning by lightning. No structures are threatened and no injuries were reported Friday. Ed. note: This article has been updated with new information provided by the U.S. Forest Service. Division of Resources name corrected. Well lets see if we can make a connection, an idiot has posted on facebook, and here several times. That he wholeheartedly believes this whole mountain needs to burn. He also states that he has a hike planed in the area on friday… Anyone else see a connection to the new fire this morning? We can hope he made the hike and has not been heard of since. LOL. !… the person had a hike planed for that day..? how can someone plane a hike. ?